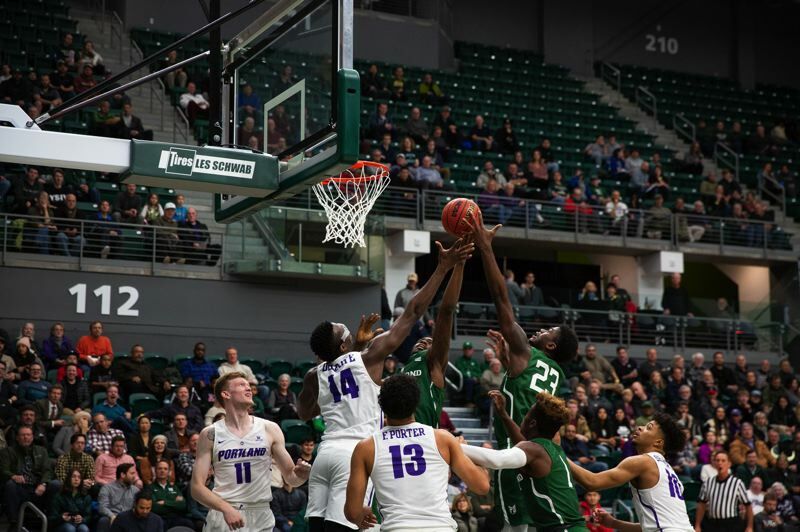 The difference between the Portland State Vikings and Portland Pilots during Wednesday's crosstown men's basketball contest jumped off the stat sheet the way the home team jumped around the rim. The Vikings grabbed 26 more rebounds than the Pilots and scored 28 second-chance points in a 87-78 win in front of 2,020 fans at Viking Pavilion. "We just couldn't match them on the boards. That was the game," Portland coach Terry Porter said. "We just didn't do a good job of taking on that challenge." Portland State turned 27 offensive rebounds — only two off Portland's rebound total at both ends — into a 28-6 edge in second-chance points. Crashing the offensive glass is part of Viking coach Barret Peery's blueprint. So the Pilots knew what was coming but couldn't stop it. Peery figured his team's depth might be a big advantage, noting that he used 10 players — nine of whom played at least 14 minutes — while six players played the bulk of the minutes for the Pilots. "I thought that would eventually get to them a little bit, which it maybe did," Peery said. It was the third consecutive win in the crosstown rivalry game for Portland State, which improved to 5-3. Portland's third loss in a row dropped it to 5-5. Sophomore 6-0 guard Holland "Boo Boo" Woods scored a season-high 27 points to pace the Vikings' offense. Senior 6-7 forward Jamie Orme had 10 points and 13 rebounds for PSU. Portland had four players score in double figures, led by 17 points and seven assists from 6-1 sophomore guard JoJo Walker, but couldn't overcome the rebounding difference and some tough shooting from the perimeter and the foul line. Portland State guard Michael Nuga scored 10 of his 13 points to spark a 15-2 spurt early in the second half that put PSU up 15. The Viks led by as many as 19 in the second half. The Pilots scrapped to within 81-76 with 1:08 remaining but got no closer. Portland led by as many as eight points early as the Vikings started 3 for 18 from the floor. Woods hit 5 of 7 3-pointers in the first half as PSU turned an early eight-point deficit into a four-point halftime lead. Woods entered the game shooting only 22.6 percent from 3-point range. "I never gave up on my shot. I know that I'm a good shooter. It wasn't shown early in the season," Woods said. "My teammates were finding me easy ones. I knocked down a few easy ones so then I got it going." Rebounding wasn't the only way Portland State impacted the game around the rim. Sal Nuhu, a 6-8 junior JC transfer from Bronx, New York, supplied the Vikings with 10 points, nine boards and six blocked shots. Senior guard Derek Brown added 10 points for Portland State. One bright spot for the Pilots was committing only 10 turnovers against a Viking team that pressures full court. Portland, in fact, outscored PSU 23-12 off turnovers. Peery said the full-court pressure did its job even if it didn't result in Pilot turnovers. "Maybe they don't turn it over, but when you're tired it's hard to block out, it's hard to go rebound every time. And we try to keep coming with fresh bodies," Peery said. Ultimately, maybe fatigue factored in the Pilots' shooting struggles. In the first half, it was the free-throw line that was a challenge for the Pilots, who were 8 for 17 at halftime. In the second half, the 3-point line became the stumbling block for the visitors. After going 5 for 9 from distance in the first half, the Pilots made only 2 of 15 second-half 3-point shots. "We had some good looks, shots didn't go down," Porter said. "We can't just settle for 3s, live and die by the 3-ball. We had some results when we shot-faked and penetrated under control, and got some looks inside." Portland 6-7 junior Josh McSwiggan struggled through a 3-of-10 shooting night, with seven attempts from 3-point distance. He played all 40 minutes and finished with 14 points. Marcus Shaver Jr. had 14 points and three steals, and Malcom Porter scored 10 points on 4-of-5 shooting. Shaver and Woods are both from Phoenix, Arizona, and are friends. Woods said he is glad to have city of Portland bragging rights over Shaver for another year. "It's a lot of fun to play against him, and this rivalry's great. It's a lot of fun to play in. You can feel the intensity," Woods said. "It's bragging rights. We can say this is our city for the next year." The Vikings and Pilots both expect to get some reinforcements soon. Portland State senior guards Michael Mayhew and Vontae Carter will be academically eligible to play in the Vikings' next game, which is 6 p.m. Dec. 12 at BYU. Portland 6-1 guard Xavier Hallinan, a junior transfer and Central Catholic grad, can play beginning on Dec. 15, and the hope is that freshman Jacob Tryon (plantar fascitis) can return by mid-December. Portland guard Crisshawn Clark (ankle surgery) is out until at least January. The Pilots play their next four games at Chiles Center, beginning at 7 p.m. Saturday against Sacramento State.